Robert Mugabe is not sleeping in meetings as a series of images would suggest. In fact, his PR man has said, he is simply resting his eyes. The state-run Herald newspaper on Thursday quoted spokesman George Charamba as saying the 93-year-old Zimbabwean president has a medical condition that means his eyes cant handle bright lights. He spoke after Mugabe left this week for medical treatment for his eyes in Singapore. I feel like a failure when there is this reading that the president is sleeping in conferences no, Charamba said. 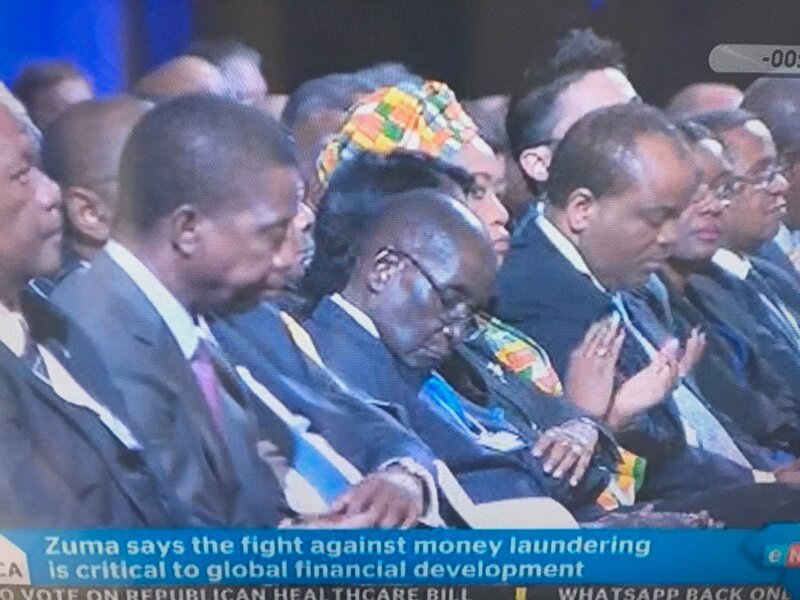 The comments came after Mugabe was captured apparently dozing at a World Economic Forum meeting in South Africa this month. It isnt the first time he has been photographed mid-nap. It also happened during Ghanas 60th anniversary of Independence parade in March. Mugabes weakening health is being watched carefully in Zimbabwe. Images of him struggling to walk on a red carpet and toppling from a raised lectern in 2015 have trended on social media. He has been in power since 1980 and says he will run for election again next year.